Every day is a new beginning and a fresh start. One of the best things that you can do for your body is to kick start the day with warm lemon water, which will provide the benefits outlined below. Balances the pH levels in the body: Lemons are actually a highly alkaline food. Lemons are acidic on their own, but once they are inside the body they’re alkaline. An alkaline body is a healthy body. Acts as a natural diuretic: Lemons flush out undesirable materials such as toxins as the rate of urination increases. Cleanses the liver: Lemons support liver function by invigorating liver enzymes and assist in new enzyme creation. They also regulate blood carbohydrate levels, are a natural antiseptic and kill detrimental bacteria. Boosts the immune system: Lemons are high in vitamin C, which is good for warding off coughs and colds, and also contain potassium, which controls blood pressure and stimulates brain and nerve function. Aids digestion: Lemons are packed with vitamins and minerals which help loosen toxins in the digestive tract. The warm water also stimulates the gastrointestinal tract which creates peristalsis – the muscle contractions within the intestinal walls that keep it all trucking along. 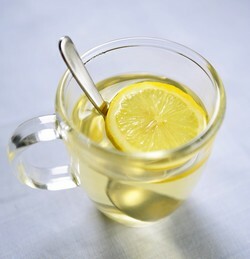 By incorporating warm lemon water into your daily life, you will be feeling so fresh and so clean clean in a jiffy. Fill glass to half way with fresh, cold water. Top up with freshly boiled hot water. Add the juice of half a lemon. Sip this satisfying brew slowly whilst thinking positive thoughts about the day ahead – remember – it’s going to be a good day.